The SD memory card port is located directly behind the face plate. 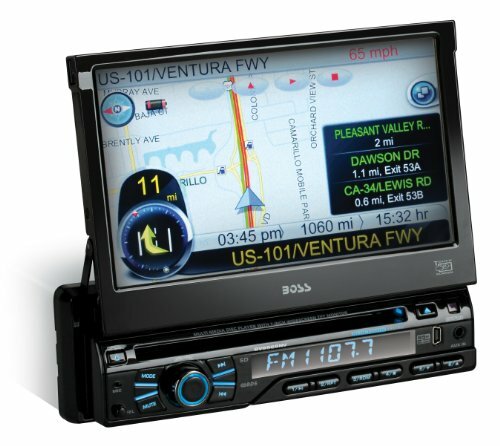 Built-In Navigation The BV9969NV offers a built-in navigation so that you are sure to get to your destinations with precise accuracy. Our navigation includes map coverage of all 50 states, as well as Puerto Rico, Canada, and Mexico. With over 2 MILLION points of interest you can find anything, like an ATM or a Bank, Hotels and Motels, Camp sites, Gas stations, Hospitals, and more. Turn-by-turn directions are provided via on screen prompts and spoken voice instructions. The mapping software can be easily updated by downloading the new data to an SD memory card from your computer. The upgrade is even free during the first year! Full iPod / iPhone Control You are able to play your music through your iPod/iPhone just like you always would via a 30 Pin Dock connector cable that connects to the back of the BV9969NV and is in the form of a USB port. Important: If your Boss Audio receiver has a USB port in the front of, like most do, you will not be able to have the “Full iPod/iPhone control”. This only will work if you insert a USB memory stick. Switchable US & Europe Tuner Frequencies The BV9158B will not only be able to pick up U.S. frequencies but it also will have the capability to pick up European frequencies. Output Power: 85 Watts x 4 Channels. Playback: DVDR/RW VideoCDRW Audio & VideoMP3 / WMA Bluetooth Audio Streaming Bluetooth technology is a short-range radio technology that was developed to provide wireless audio and data transmission. Two Bluetooth-enabled devices (like a mobile phone and a car) can be paired so that they establish a communication link when they come within range of each other. Depending on the device, the range can be anywhere from 3 to 300 feet. The BV9969NV supports A2DP (Advanced Audio Distribution Profile). A2DP is a Bluetooth profile that allows for the wireless transmission of stereo audio from an A2DP source (typically a phone or computer) to an A2DP receiver (a set of Bluetooth headphones or stereo system). Steering Wheel Interface The interface capability allows you to connect your existing steering wheel controls straight to the BV9969NV in a wide variety of vehicles. You will be able to control the volume, change channels, answer calls, and more. Compatible With Audio Output of iPod / iPhone, Smartphones, and MP3 Players Another great feature that comes in really handy is that little hole in the front of your unit that says “AUX”. What this means is that if you can connect a device that has an Auxiliary output, such as your iPhone/iPod, smartphone, and MP3 players straight into the Auxiliary input of your head unit. So basically a cable that has (2) 3.5mm audio (male) plugs. Important: Please beware that this feature is not the same as the “Full iPod Control”. This feature will only allow you to control your music by clicking on the designated buttons via the face or front side of your unit. View larger INPUTS & OUTPUTS Front, Rear, and Subwoofer OutputsVideo OutputRear Camera InputFront Audio/Video Inputs Bluetooth Hands-Free You are able to answer you phone with just one press of a button. When the call ends you can either hang up first by pressing just one button again or do nothing at all as long as the person you were talking to hangs up first. Just keep on driving without any distractions. RDS Tuner "RDS" stands for "Radio Data System" and it allows FM broadcasters to send far more than just an analog audio signal out over the air waves. Using a 57 kHz "subcarrier," stations can transmit digital RDS data for reception by RDS-equipped FM tuners. Depending on what the broadcaster transmits and what your tuner can pick up, you can receive information such as the name of the artist/song, name of the station, genre, traffic information, and more.